RADIODRONE- Hailing from Orange Country California created in the 1st quarter of 2014, RADIODRONE is part schizoid Five Finger Death Punch on the heavy edge, part Foo Fighters rock with the commercial aspects and part hard grooves(Nu-Metal); RADIODRONE seamlessly barrels from churning head banging riffs to skyscraping chorus’ and back again with smooth radio made transitions and underground power. They are equally able to dial down their bluster into deft moments of crystalline beauty when the mood takes them there. RADIODRONE, has done a fantastic job with mainstream radio friendly vocals with thought provoking lyrics with modern Nu-Metal grooves. Achievements- RADIODRONE submitted their music to the largest rock radio station in So. California the KLOS Heidi and Frank Morning show with approx 4 million listeners, RADIODRONE was chosen to be on the Stay or Go show was voted unanimously by all callers that called in and Matt Sorum (former drummer of Guns N Roses) as a matter of fact Matt Sorum stated right on the air live that he personally knows of a few record labels that would and could use a musical act like RADIODRONE. RADIODRONE then went 6 months as the number #1 artist and was chosen then to play the KLOS S.O.G. Fest to a sold out crowd at The Grove in Anaheim. 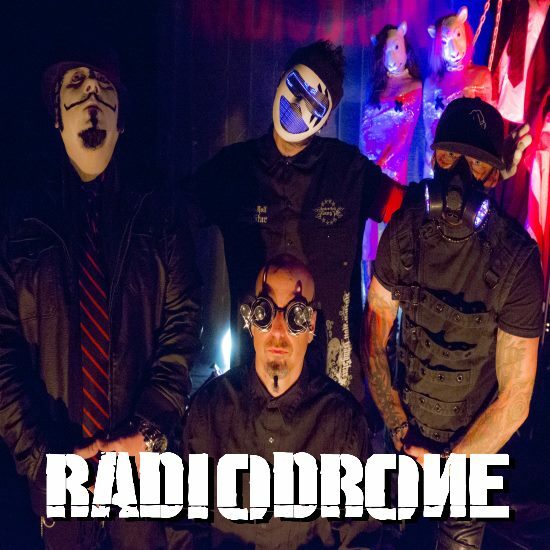 RADIODRONE is one of the top drawing local bands draws in the Orange County area and is branching out to the Los Angeles, San Diego, Riverside and San Bernardino markets and have been welcomed with open arms.